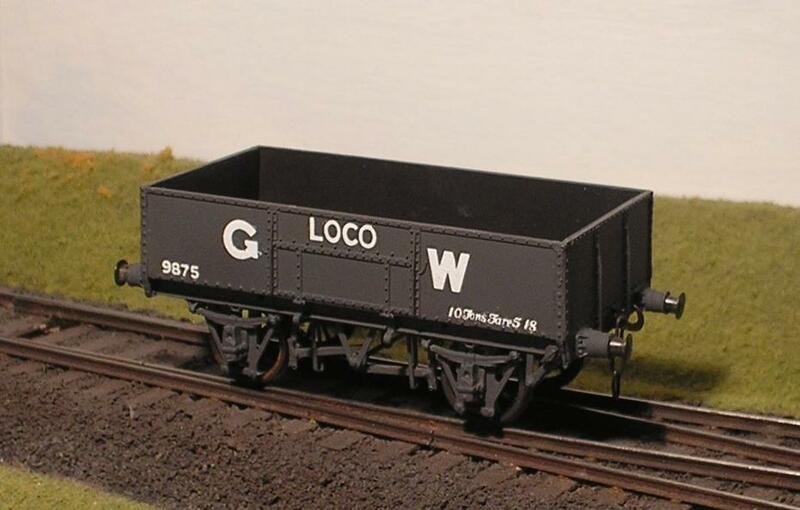 The GWR had a fleet of wagons dedicated to transporting coal to its engine sheds. Below are models of some of the 10 ton designs. There were also many designs of 20 ton and 40 ton wagon. These models are of wagons built to diagram N6, originally built in 1889 without the top section of the sides and ends. At some time the height was increased by 9". In the 1920's these wagons started to receive a second set of brakes, but with only one brake block. The furthest wagon represents an N6 without the extra brake. These models were made from the David Geen kit which is quiet nice apart from the brakes. I have replaced the brakes with levers and Vees from 51L and brake blocks from ABS. The only other modifications made were those necessary to convert it to P4; the addition of Bill Bedford w-irons and 51L sprung buffer heads. 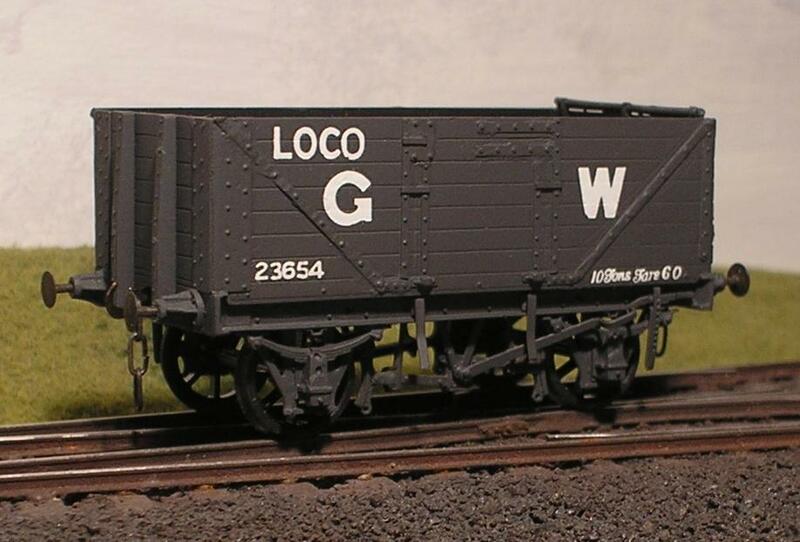 The next three coal wagons have been converted from Cooper Craft kits. Conversion to P4 (or EM) used to be very difficult with these kits. 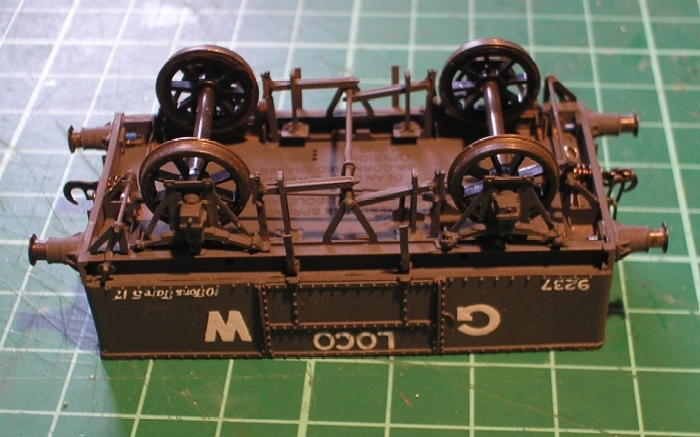 However, Masokits have introduced a sprung chassis kit just for the Cooper Craft kits. In order to provide enough weight in these plastic kits I have replaced the floor supplied with a composite floor. The new floor consists of a 1.5mm thick sheet of lead sandwiched between two pieces of 10 thou plastic. The kit as sold is too narrow, so to increase the width 60 thou of plastikard was added to the edges of the end pieces before the body was assembled. The model is of a wagon built to diagram N13 in 1905. The Cooper Craft kit is supposed to represent this design. However, a couple of modifications are necessary. The first is to change the corners from square to round. This can be done by filing the corners on the outside and fitting a triangular fillet inside. Then triangular corner caps need to be fitted to the top of the sides. The Masockits brake gear is for DC III, like the N19 & N20 below. N13s had DC I brakegear so a swan-neck lever is required from the Masokits DC I brake gear kit. The model is of a wagon built to diagram N19 in 1912. In addition to the body modifications necessary for the N13, the buffers have also been replaced. The buffer housings are from the ABS range. These have been drilled 2.2mm all the way through. The buffer head is made from a 51L 12" buffer that has been fitted with a 2mm shank made from plastic tube. A spring is put on the shank and fitted in the housing. It is held in place by a tiny piece of plasticard drilled 0.6mm and a 1mm length of insulated from telephone cable. 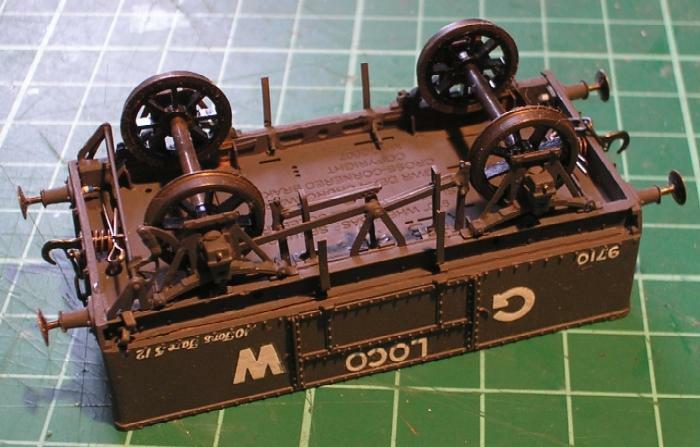 The model is of a wagon built to diagram N20 in 1915. The chassis modifications are the same as the N19 above. The N20 had square corners similar to the way the kit is supplied. However, there was extra reinforcing around the corners. This was made by using etched brass strapping sold by Mainly Trains. The GWR had many wooden bodied loco coal wagons. One design was given the diagram N33 and was identical to the BUTE wagon on PO Wagons. This is a model of an ex Taff Vale Railway loco coal wagon. The body is a modified Slaters kit, the solebars and axlesboxes are Cooper Craft and there are many other parts.